Let your data fly with WebDAV Airlines from your iOS device to a cloud storage of your choice. 1 Tap on ‘Send a copy’ and select a document and the file format. 4 Choose a folder to save the document. Tap on ‘+’ and select ‘Copy from WebDAV’ to fetch a document from your cloud provider. WebDAV (Web-based Distributed Authoring and Versioning) is a method that allows you to manage files stored on remote servers. By linking to a WebDAV location from your iWork app, you can easily copy documents to and from a remote server or web service. a communications protocol is a system of digital message formats and rules for exchanging those messages in or between computing systems and in telecommunications. A protocol may have a formal description. Protocols may include signaling, authentication and error detection and correction capabilities. A protocol definition defines the syntax, semantics, and synchronization of communication. Communications protocols have to be agreed upon by the parties involved. It’s not digital and non-standardized. Nevertheless I hope you will understand this article. 1 Non-iCloud storages do not support synchronization across your devices automatically. 2 It’s always a good idea to save relevant documents in more than one place. So use iCloud and an other cloud for backups. 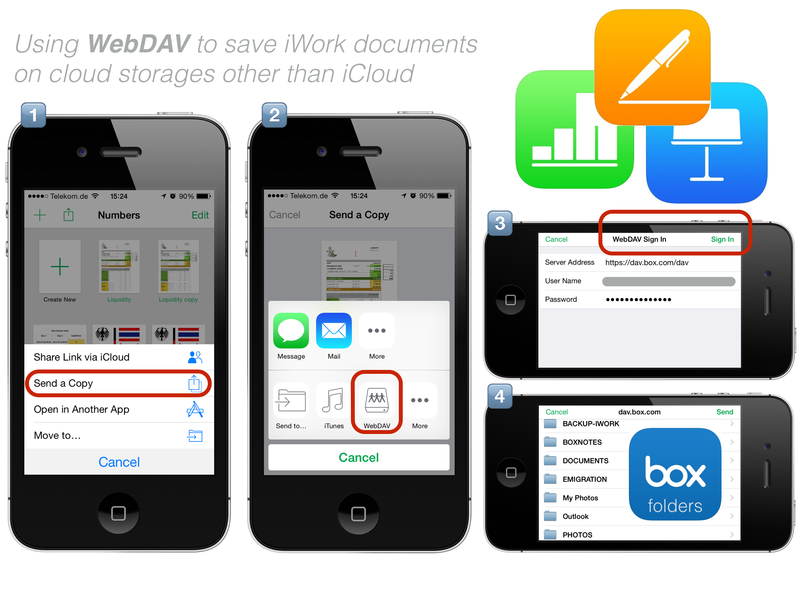 3 iWork for iOS supports WebDAV as well as Box, OneDrive, Google Drive, and Dropbox. 4 If you work with both suites, Apple iWork and Microsoft Office, it’s recommended to use Microsoft OneDrive or Dropbox. If you need WebDAV access for other reasons you should know that OneDrive and Dropbox don’t support WebDAV. It’s recommended to install a powerful file manager like FileBrowser to manage your files (copy, move, delete, rename, etc).